I found myself surrounded by combat probes, sitting still, waiting for a fleet of twenty to drop on my head. It was a disturbing feeling. I had asked for it to happen. Yet, the itch down my back and the urge to move was hard to resist. I had insured my ship and I was going to die. I felt strange sitting still and waiting for it. I wanted to pace, but the fleet was in position. So I sat still, hand hovered over my mouse, drones out, waiting. I have such a love/hmm relationship with Eve Uni. I love the place and love the concept but have some issues with some aspects of it. However, it is what it is and at the end of the day I'd say that it is a fantastic corp that has been created in the bigger picture. In one of my chatrooms that involve some of the Eve Uni peeps I have made friends with, I was asked how many people we had on. "Some," was my normal noninformative answer. What bubbled up was that they had just had a long roam with no action. Knowing me, and having tangled with my alliance several times in the last few weeks they wanted to know if we wanted to play. I dropped the question into our channels and I was met with a chorus of, "Yes. Tell them yes!" I pulled my hair back into pigtails. This keeps it away from my headset and off my neck. This was serious business. I've never handled the negotiations for a fight before. We were hungry for it. I wanted to provide them the fight. Myself, I wanted the fight. I won't lie. I was excited. Hearding cats however, was exhausting. But we managed to get a fleet together. I won't go into the back and forth of it. What it turned into was a group of 20 Eve Uni vs 9 of us. We did battle cruisers. Pure hurricanes and drakes with no logi. Eve uni had a mix of frigs, destroyers, cruisers, and battle cruisers, cloaky things, and some interceptors. We will fight on a planet. No gate guns no station games. We will wait for them. Not the best battle situation to put ourselves into. However, it was a flight. On the way to setting it all up, one of our guys got popped in a gate camp. I'll discuss that later in another post. We got ourselves together, minus one. Eve Uni fleet arrived and we went and settled down at a planet and waited... and waited.. and waited... with about 14 combat probes out pinning us down. We waited and waited some more and then they pulled the probes and jumped into system. "They are going to land on the hurricanes." "God knows. We are where we said we'd be." The FC went down first. One of the drakes took over. We have a pretty fluid FC system thankfully. I locked, I burned out of the lock reoriented and started to lob DPS at the primaries. Then I started taking damage and I was swarmed. New feeling that. I shot,I set drones on people, I tried to figure out who was tackling me to break it, I took damage and I went down. Per my killmail, 14 people were on me. I warped my pod off "Reship?" "Hell yeah." I reshipped. Another cane was waiting for me in station and I slipped in, undocked, and headed back out. All canes and Myrm were down. 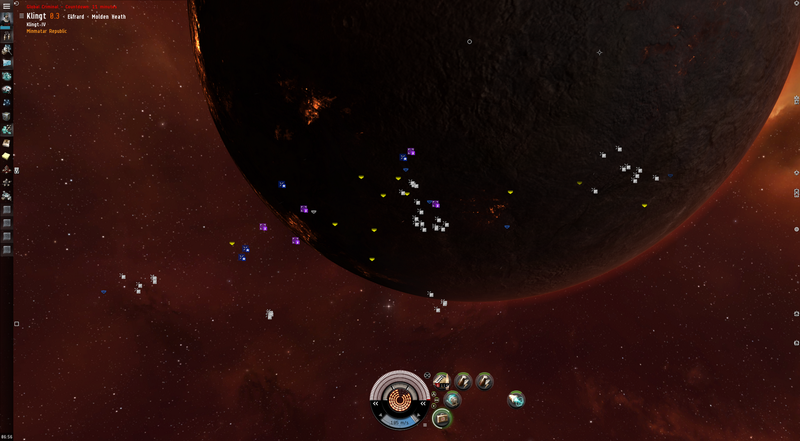 The drakes were calling primary and the Eve Uni fleet was exploding left and right. We reshipped and landed back on the field for the second half. People started to warp off at that point and we nailed a few more kills before the field was empty. The end score was 13 of them and 4 of us. They did a good job taking out all of our higher DPS ships. In reality we'd normally not just sit there, but this was a different type of situation. A new one for me. An exciting one if uncomfortable. 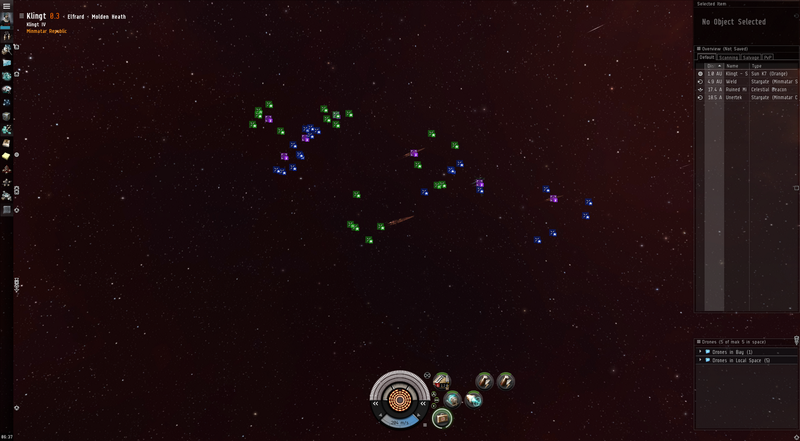 We held the field and I reminded them not to loot the Eve Uni wrecks. We cleaned up our wrecks and drones and docked so that Eve Uni could do the same. Good fights were shared and thank you's on both side. So many targets also makes primary a lot more complex. Eve Uni waited out their GCC and headed home. I would like to say that I am very proud of them for taking GCC and attacking first. Fun times. I was part of the Uni blob and can confirm it was a great fight, it took us a little while to get into your system as we took out a flashy wolf along the way and there were a couple of disconnects. You guys fought us with a lot of honour and kept all your promises regarding position, podding and looting. We had quite a few new people to fleet and their experience alone from that one fight was more than worth it. After all the shooting stopped comms was buzzing and the guys loved it. We were surprised to realise the Myrm had no tank and I was surprised to read here that we got the FC first. I don't think that was planned other than to shoot canes first lol. Good times all round, I distinctly remembering pointing you, and getting into orbit Sugar before I started to cop a lot of fire and warped out in structure to repair. Great blog keep it up. Good hunting.